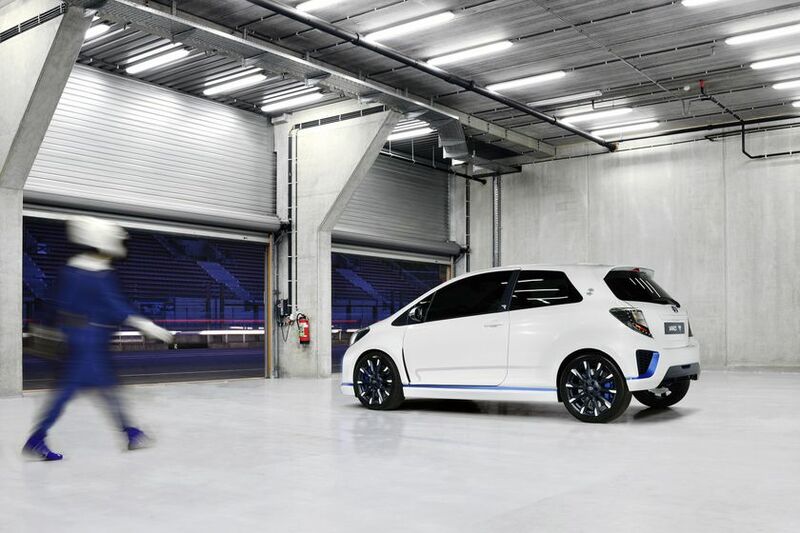 Making its World Premiere at the 2013 Frankfurt Motor Show, the Yaris Hybrid-R concept car combines the advanced technology of the subcompact volume seller Toyota Yaris Hybrid with high-performance engineering inspired by Toyota’s racing prototype, the TS030 HYBRID, which participated at Le Mans and in the World Endurance Championship. The result is a highly focused concept car dedicated to maximizing driving pleasure on road and on track. 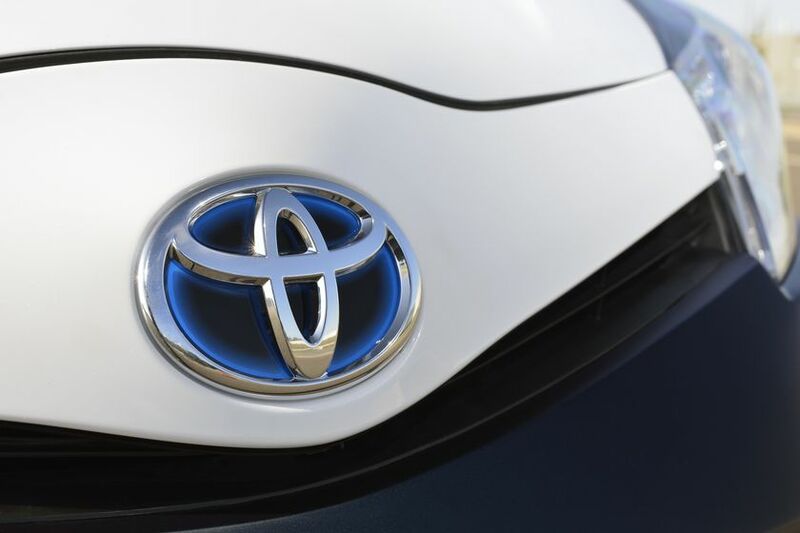 Hybrid technology is still young - with the first generation Toyota Prius appearing in 1997, just 16 years ago. As such, it still has its future ahead and great potential to evolve in many different directions. 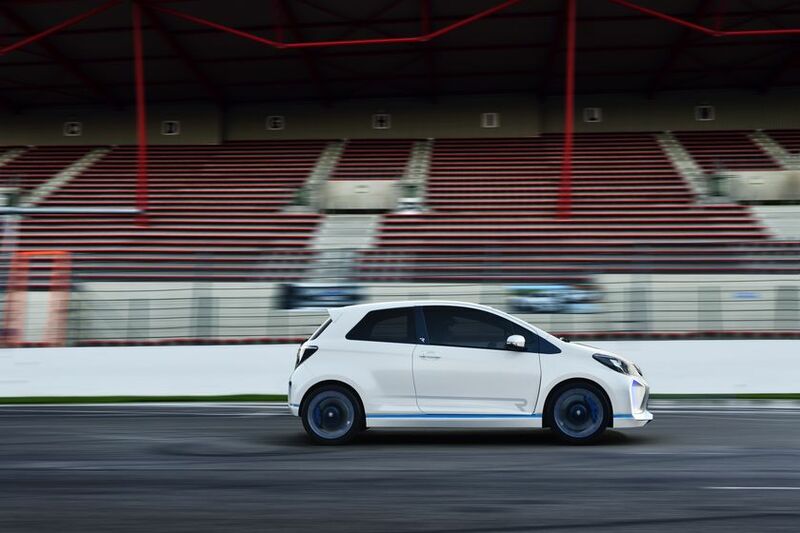 Only recently, hybrid technology has started to appear in racing programs, but is not yet fully established in people’s minds as a performance oriented solution. 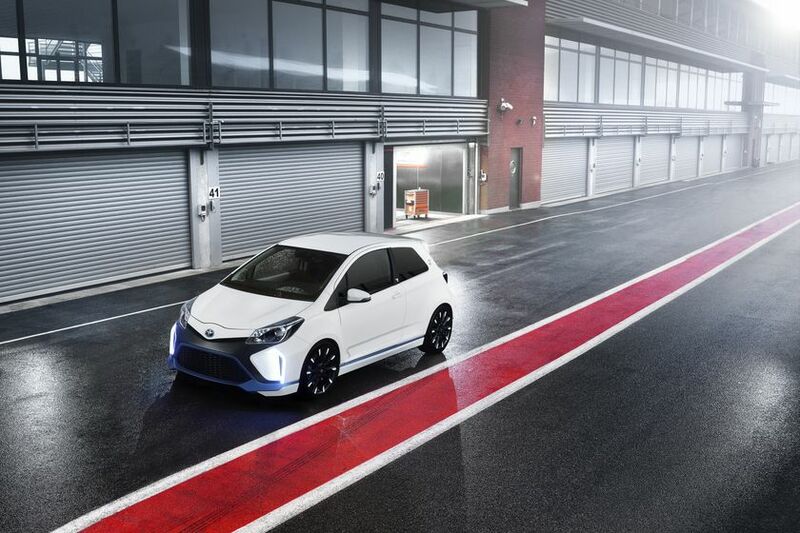 The Yaris Hybrid-R concept car is a clear showcase of possible ideas for the development of hybrid technology for maximum performance and increased driving pleasure. 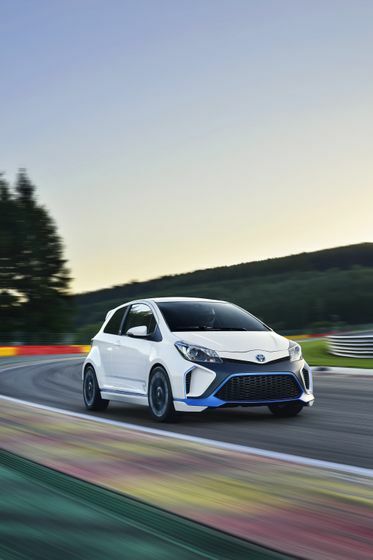 Based on the Yaris 3-door, the Yaris Hybrid R concept hybrid powertrain configuration, employs a powerful and highly tuned 1.6l gasoline engine combined with two powerful electric motors to provide an ‘intelligent’ electric four-wheel drive capability. The front wheels are driven by a 300hp 4-cylinder 1.6 turbo engine with direct injection specifically developed by Toyota Motorsport GmbH (TMG) according to the rules of the International Automobile Federation (FIA) for a Global Race Engine to be utilized in different motorsport disciplines. At the rear, each wheel is individually powered by a 60hp electric motor – the same as those used in the standard Yaris Hybrid. The hybrid powertrain system develops a total system output of 420 hp. The two electric motors work as electric generators during the braking phase, and supplement the gasoline engine during the accelerating phases. Just like in the TS030 HYBRID, the energy recovered during the braking phase is stored in a super capacitor. 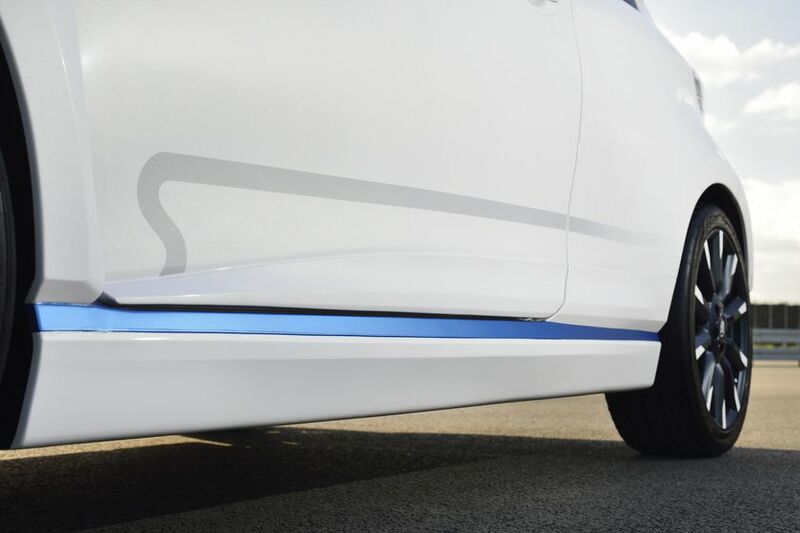 In the Yaris Hybrid-R it is located under the rear seat, where the Yaris Hybrid battery is usually positioned. Compared to the standard NiMh hybrid battery, the super capacitor has a higher power density and a fast power charge / discharge speed. 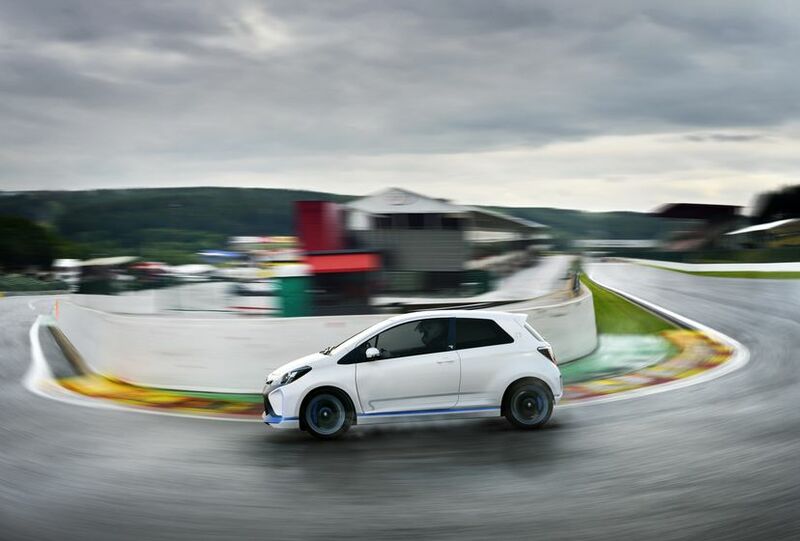 It is perfectly suited to the requirements of sporty driving on track, which requires brief and immediate bursts of power. 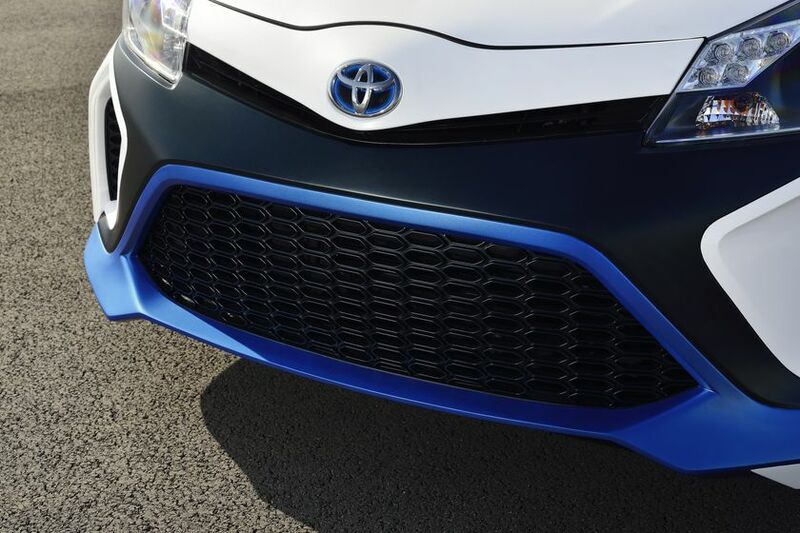 The Yaris Hybrid-R features a more aggressive and emotional interpretation of the design language that characterises recent Toyota models. 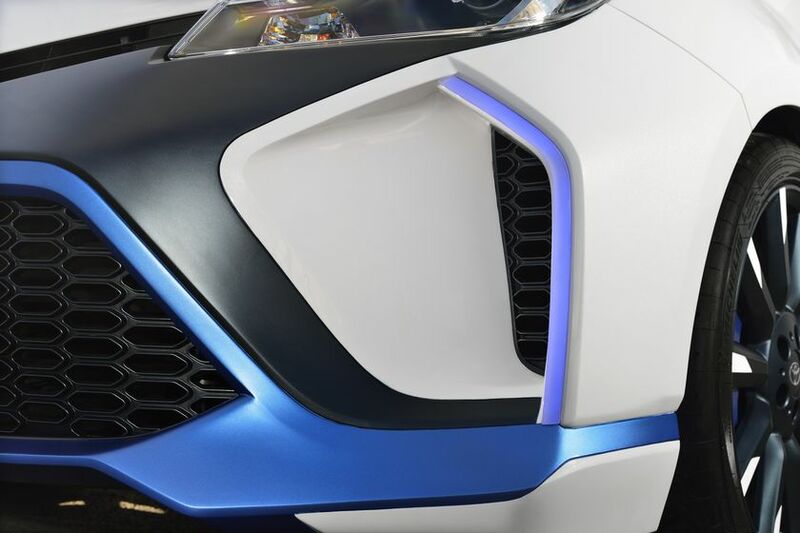 The Keen Look and Under Priority design philosophy is reinforced by the adoption of newly designed headlights, a wider front grille and black and blue details that contrast with the white body colour. 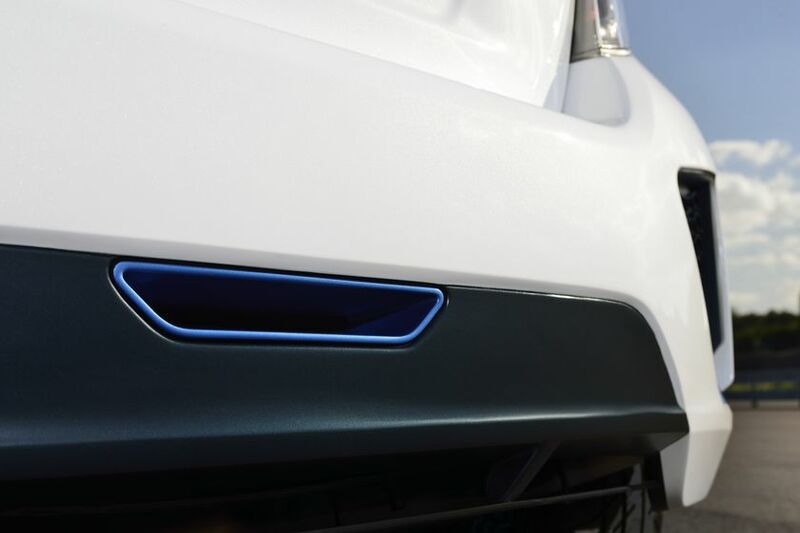 The specific bumper design incorporates two large air intakes and blue LED daytime running lights. 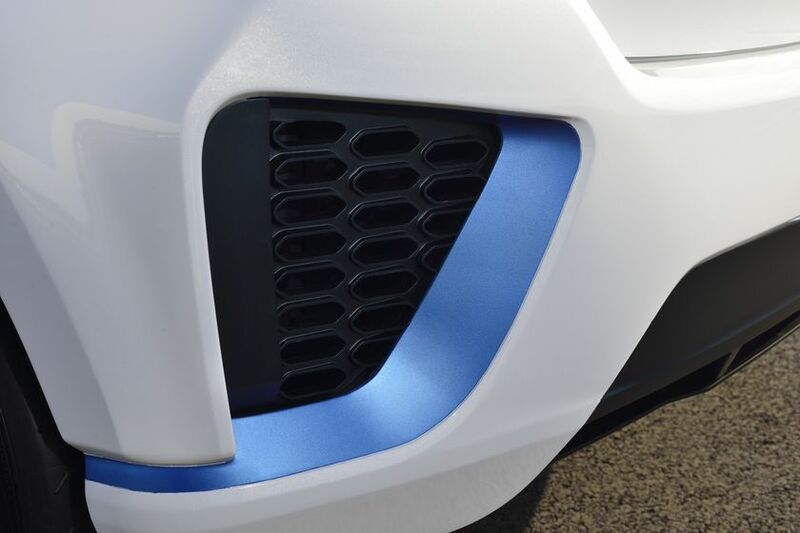 The intakes greatly contribute to the front brake cooling, while the shape of the lower lip is designed to centrally channel underbody air flow. 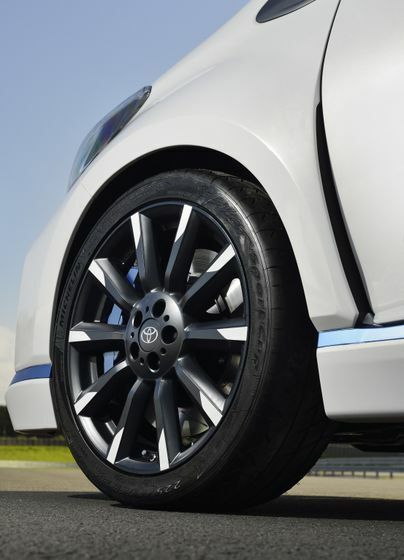 The flared fenders house bespoke 18-inch TRD wheels fitted with 225/40 R18 Michelin Pilot Sport Cup tires featuring an asymmetrical tread design to complement the Yaris Hybrid-R sporty philosophy. Ideally suited for a mixed use on the road and on the track, this choice of high-performance tire is a symbol of the fruitful cooperation between Michelin and our racing team involved in the World Endurance Championship series. Grooved and perforated brake discs are gripped by six-piston callipers in the front and four-piston callipers in the rear. 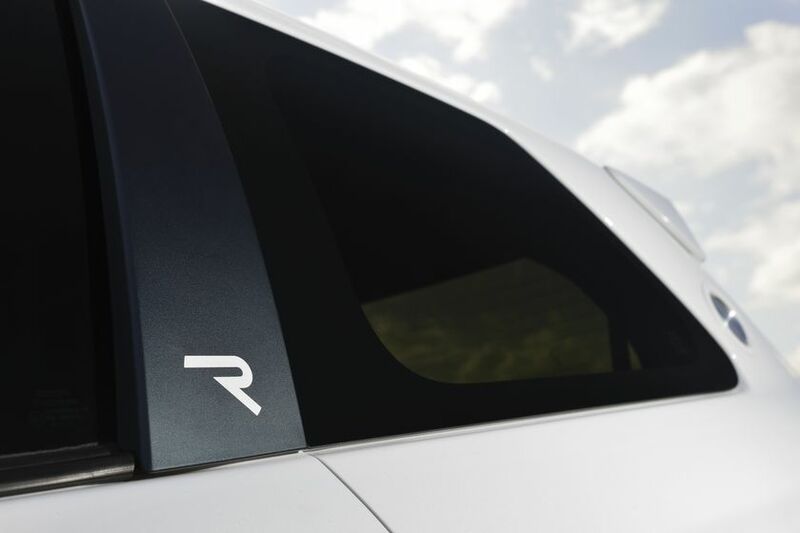 Located on the rear pillar, a quick opening fuel cap makes refuelling in the pits easier. 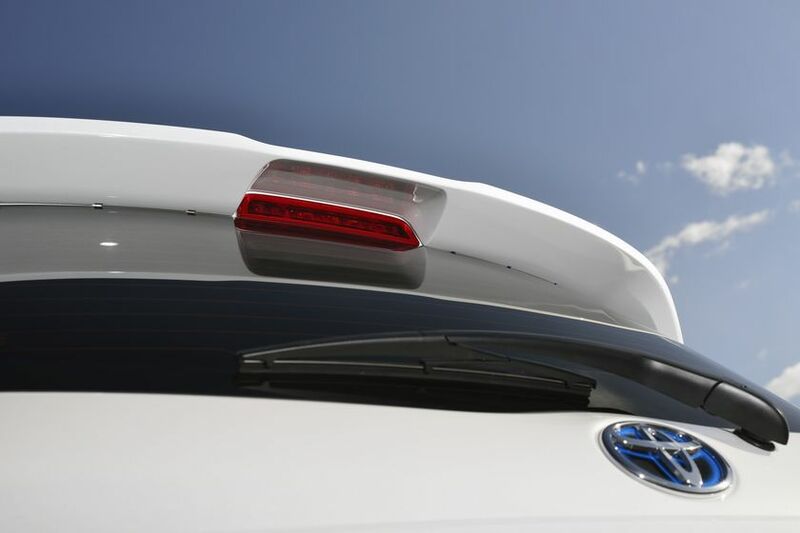 At the rear, Yaris Hybrid specific LED lights maintain the link with the production car. 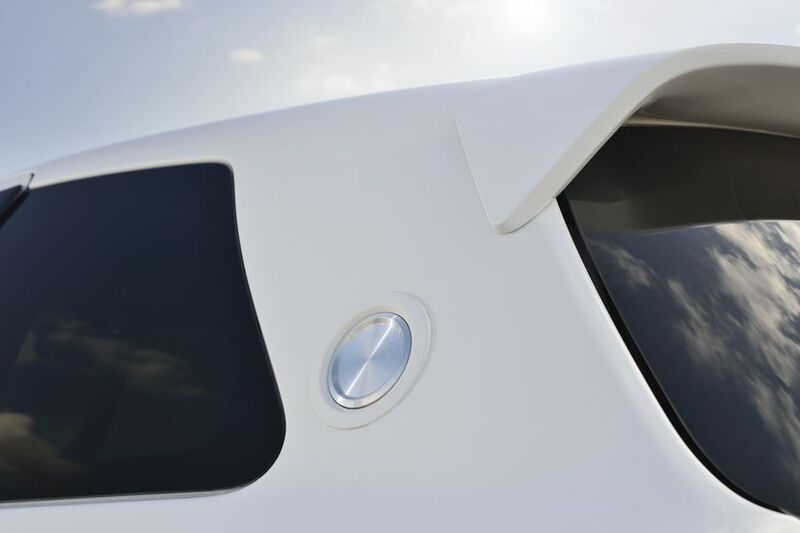 An exclusive spoiler is mounted on the roof and the redesigned bumper incorporates a large diffuser, with an exhaust pipe framed by two air extractors. Matching the colours outside, the dual tone Recaro bucket seats feature black leather side bolsters and blue Alcantara®. The same blue Alcantara® covers part of the door panels and the dashboard to give the interior a more cohesive, racing-inspired feel. Ideally located high and close to the driver's right hand, the shift lever of the sequential gearbox is set up to quickly change down gears by pushing the lever forwards, and to change up by pulling it back. The sport steering wheel wrapped in Alcantara® welcomes a racing inspired push button to select, at rest, either the "Track" or "Road" mode, or while driving, the "Boost" function. The driving position is ideally completed by a set of GT 86 sport pedals. 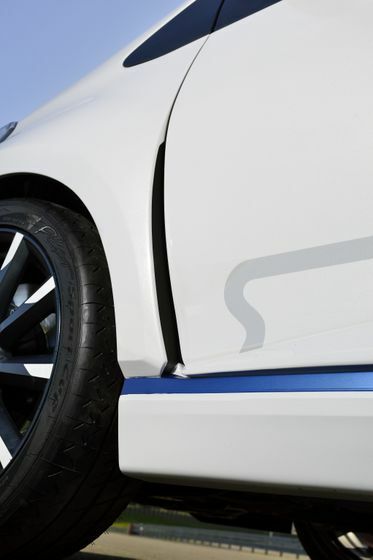 The ‘Road’ mode is characterized by a reduction of the engine output and an appropriate management of the amount of energy the super capacitor can distribute to reduce fuel consumption and CO2 emissions. Accordingly, the turbo compression ratio of the 1.6l engine is reduced and the injection / ignition mapping adjusted. The hybrid system works seamlessly with the 1.6 turbo gasoline engine, especially during the start-up phase at low rpms when the efficiency of the conventional engine is not yet optimum. The super capacitor can release the energy recovered under braking for a maximum duration of 10 seconds, while the total power of the two electric motors is limited to 40 hp. To maintain a sufficient state of charge in the super capacitor, the third electric motor can be used at any time as a generator. 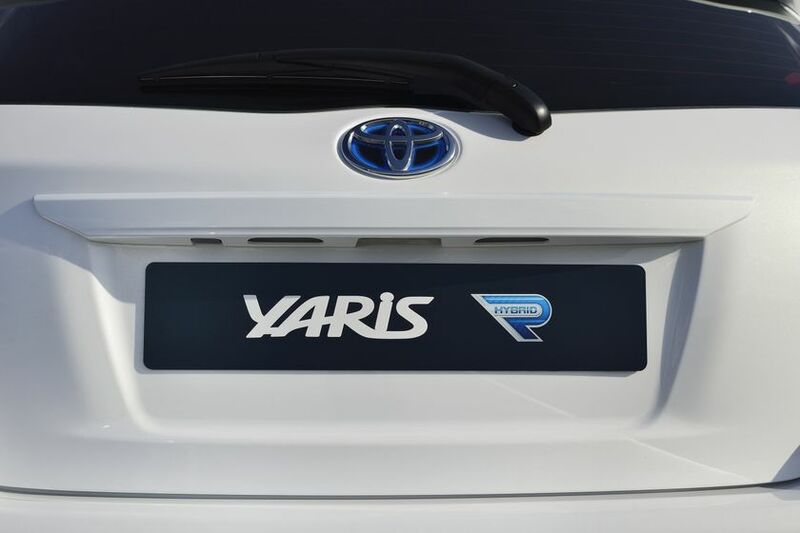 Depending on the state of charge of the battery, the Yaris Hybrid-R may also operate in full electric mode for short distances, especially during parking operations. The ‘Track’ mode makes full use of the maximum system output of the engine and a performance oriented energy management. 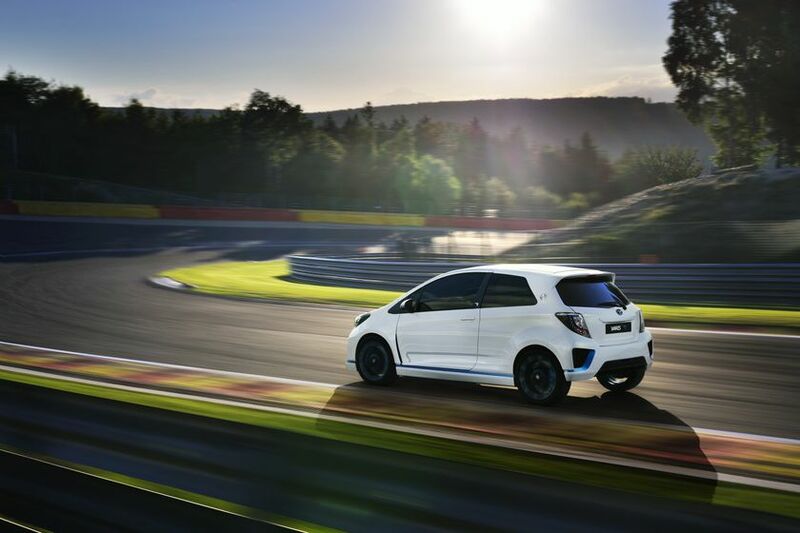 The 1.6 turbo engine develops 300 hp and provides maximum torque of 310 ft-lb, while the rear electric motors can reach a combined maximum power peak of 120 hp for up to 5 seconds. At low speeds, or in a curve, when the engine power and torque exceed the grip potential of the front wheels, the third electric motor can directly power the rear electric motors. The generator behaves like an advanced traction control system, redirecting the gasoline engine extra amount of torque as electric energy to the rear wheels. Each engine can be used independently as a generator or a motor to achieve the same effect as an intelligent torque vectoring differential. 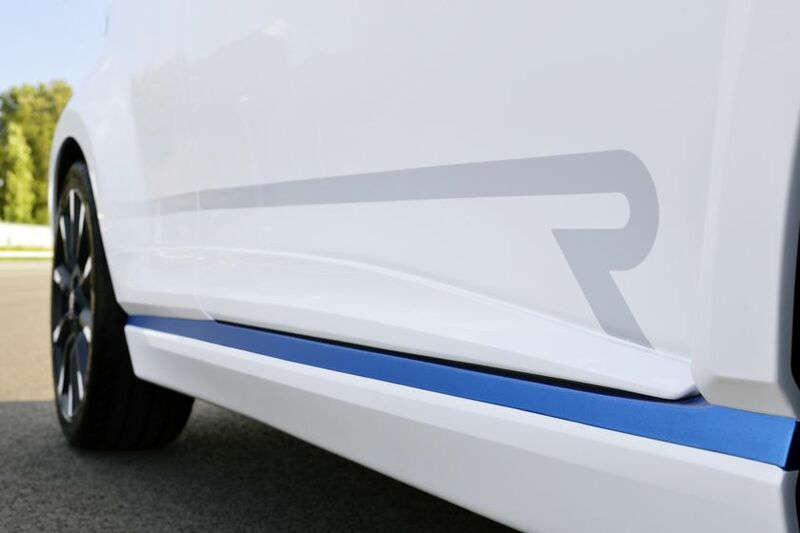 With the particularly high system output of its hybrid powertrain, an energy management system strongly oriented towards the reach of maximum performance and the utilization of the engines for better handling, the Yaris Hybrid-R concept indicates a potential direction for the development of hybrid technology towards more driving pleasure. 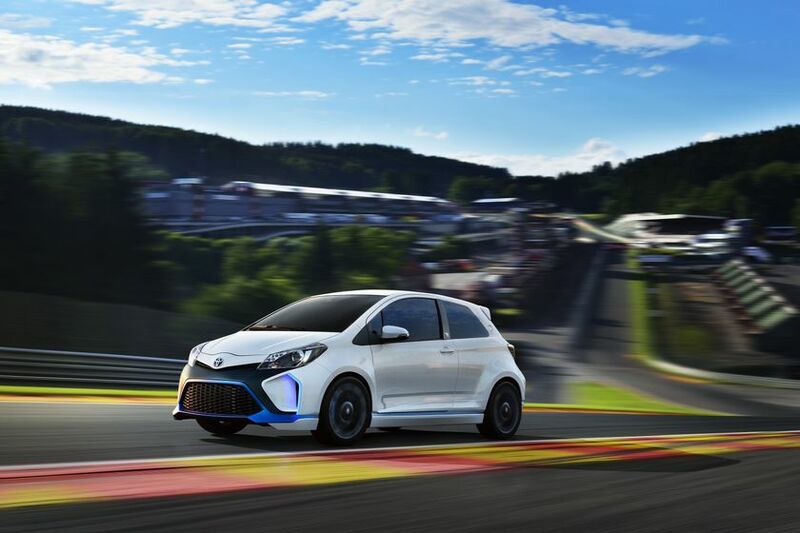 The Yaris Hybrid-R concept utilizes the same CAN-Gateway ECU system developed for the GT86 coupe in collaboration with the video game developer Polyphony for the 6th version of the famous Gran Turismo game to be launched before the end of the year. Unveiled last spring at the Silverstone circuit at the occasion of the 15 years anniversary of the Gran Turismo game, the CAN-Gateway ECU system allows the drivers of the GT86 Coupe to record on a USB key, or on a Smartphone, the racing data collected while driving on the track. GPS data, longitudinal accelerations, steering angles, gear changes, engine speed, vehicle speed, and even water temperature are then used to reproduce the conditions of a real lap of the track on the video game console and compare it to virtual laps done with the game. 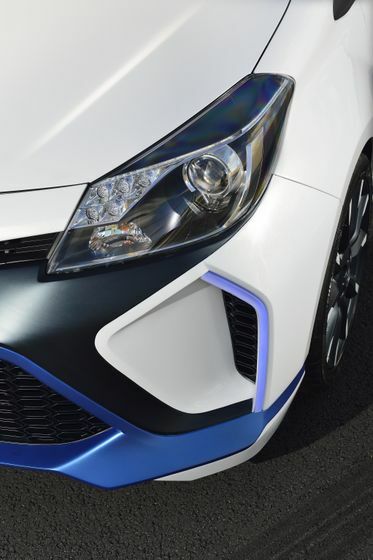 The Yaris Hybrid-R Concept takes this technology one step further, by utilising the same principle but in a reverse way. We could imagine that the data of the laps recorded through the video game could be sent to the vehicle ECU. 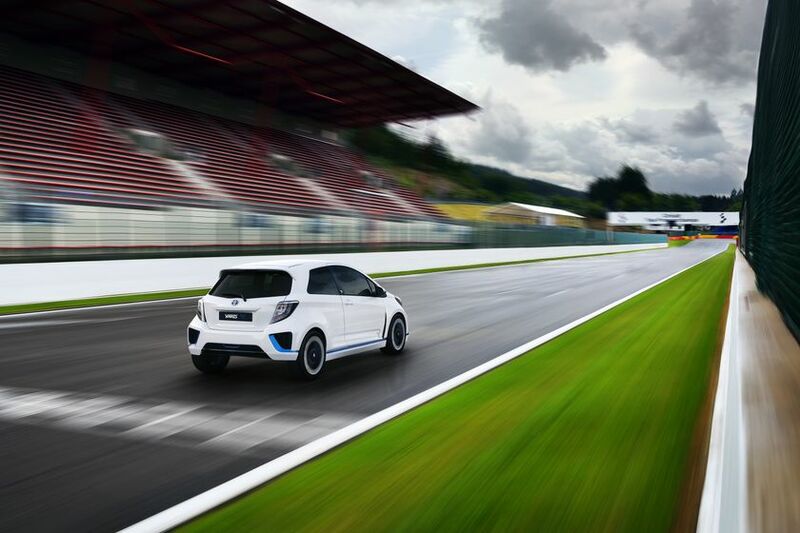 The electronic management of the car could potentially anticipate the driving conditions of each track, to optimize the phases of energy recovery, the operation of the traction control, the amount of energy used at each step and optimize the handling through the rear electric motors. 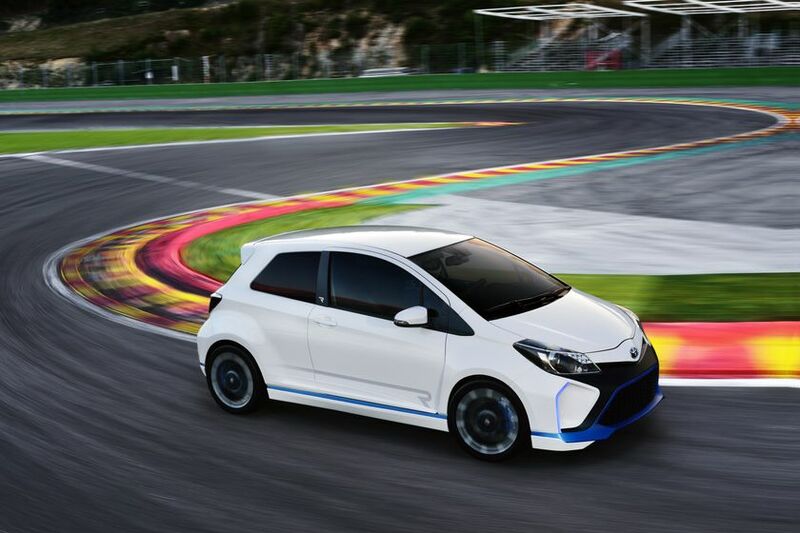 The 1.6l turbo engine of the Yaris Hybrid-R concept was developed by Toyota Motorsport GmbH. It meets the FIA regulations for a global motor (Global Race Engine – “GRE”). To reduce the cost of motorsport, the FIA has setup specific rules for a unique 4-cylinder engine designed to be used in a variety of motorsport disciplines. Each discipline can set its own technical regulations, in terms of displacement between 1.6 and 2-litre,whether it is turbocharged or not and therefore with power levels ranging from 150 to 500 hp. Originally, even Formula 1 cars could have been equipped with this engine. As this engine is specifically adapted to racing conditions, it should be more reliable and less expensive to maintain than an engine derived from the production series. Since 2011, the GRE formula has been used as a 1.6l turbo in the World Rally Championship (WRC) and in the World Touring Car Championship (WTCC). Next year, it will make its debut in Formula 3 as an atmospheric 2.0 litre version. 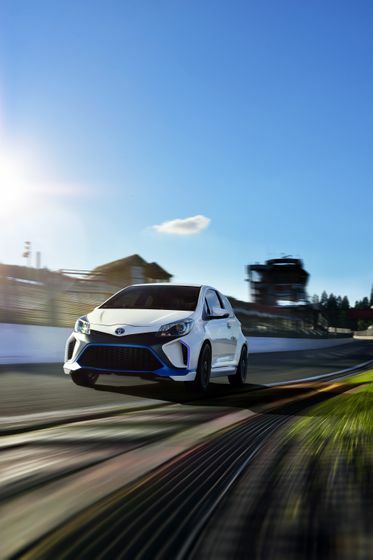 The GRE engine developed by Toyota Motorsport GmbH has already undertaken extensive performance and reliability testing on the dynamometers at the technical centre in Cologne. Upon completion of the development programme, TMG will make the GRE available to private teams whilst also using it as a base for any possible Toyota motorsport programme in the future.